Just scrolling menu is enough to crash. The menu probably most lagging thing in vrc, even more than some poor-made user's worlds. It consumes so much resorces, not every AAA shooter can eat that ammount of resources. Just a simple experiment: join vrc into default home world, open worlds menu and just scroll some lines. After few minutes you will see that game ate all your mem and if you continue you will crash. Even if you not push your game into crash contitions it will stay laggy until re-launch. Game doesn't free resources or doing that very slowly. If you go to heavy world you will see higger usage, when you leave it you will see memory freeing, but same not happens to menu. 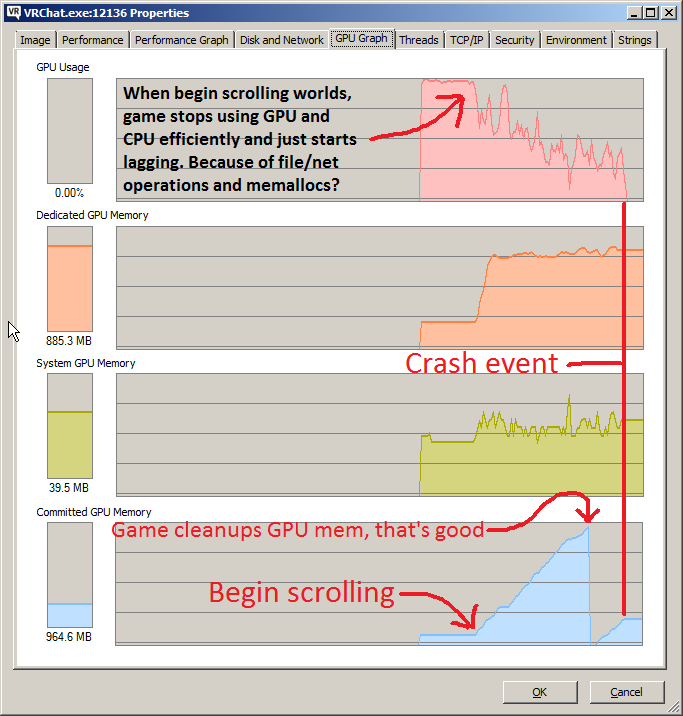 I guess in this case I don't need to post crash logs: it's obviously because of memory lack. I think optimizing menu should be priority because it's literaly face of the game. Any new players joins the game will see it and will use it intensively, especially if they have no friends. And even experienced players can not avoid using the menu. 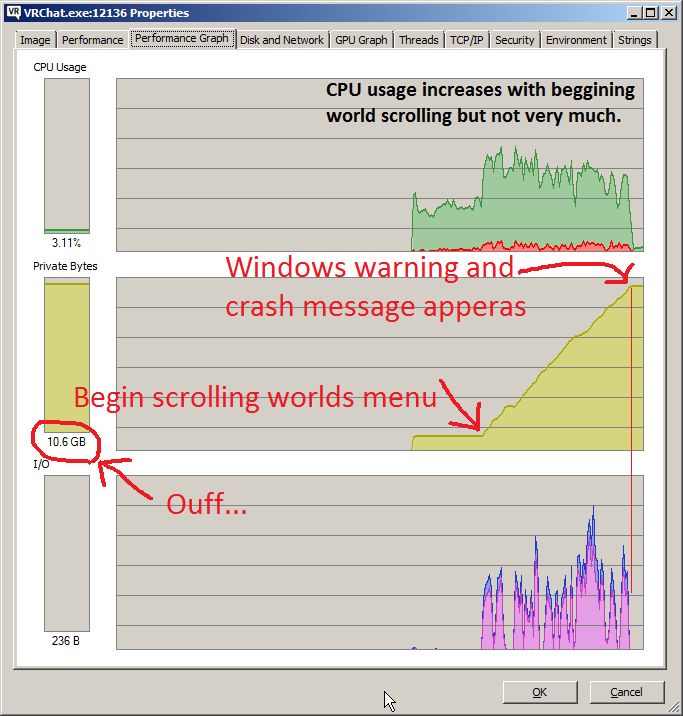 Maybe it's better to use smaller previews, load/unload it more agressive with on-disk caching and not keep it in memory? May be that happens because Unity trying to swap RAM and GPU's memory and in this case textures is not stored very efficiently in RAM? Is it possible to not relly on Unity's memory managment and try unloading manually even if it will cause some small game freezes? P.S. I only scrolling worlds in this experiment, also loading and viewing (standard) avatars causes even worst results. 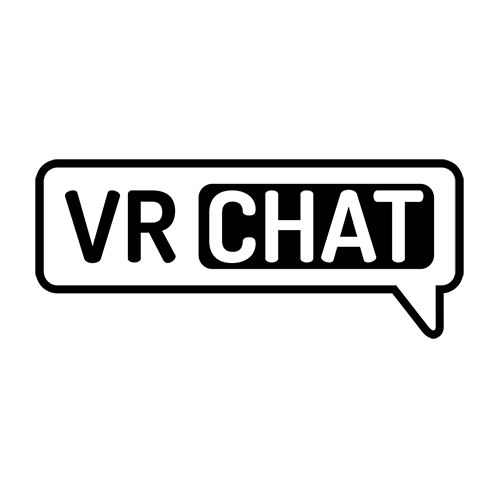 Menu performance has been significantly improved in VRChat 2018.3.2, live now! I have to add to that, that I can't log in to my VRChat account on my laptop, because the input interface on the log in screen doesn't show up. But through steam I can get in and even if its laggy can join some worlds. This is a known issue that will be addressed with a future update.